"I paint ideas, not things. My intention is less to paint works that are pleasing to the eye than to suggest great thoughts which will speak to the imagination and the heart and will arouse all that is noblest and best in man." 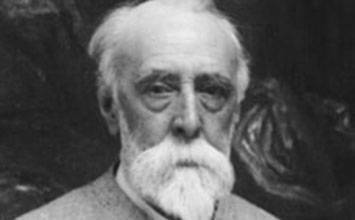 George Frederic Watts was a visionary force with a paintbrush and a powerful persona as a man. Following an extended and inspirational trip to Italy, he took to wearing Renaissance robes on a daily basis. Indeed always unusual, he revealed an early interest in the unconscious mind by preferring to depict his subjects with their eyes closed. In style, he moved organically from Symbolism to abstraction whilst other artists remained far from this point. Overall, Watts was drawn to a cosmic synthesis of all things and as such deals in recurring notions and allegorical renderings of human strength and folly, never to be distracted by the fashions and expectations of the Victorian Age. Indeed, his art straddles two worlds, that of Victorian romantic and nationalist symbolism, and that of a modernist insistence on digging to the depths and following the individual psyche. To privilege ideas and internal feelings during this era was rare, as was foreseeing the dehumanizing effects of commercialism. Indeed, a character in one of the artist's paintings, Mammon, is born as the monster to herald the absolute emotional disaster of the beginnings of a highly industrialized and capitalist society. Not only a painter, it is one of Watts' sculptures that well embodies his own character and ambition - a man on horseback looking out to the horizon with his hand to his forehead - he was an idealistic dreamer with an unwavering belief in humanity's inclination towards betterment. 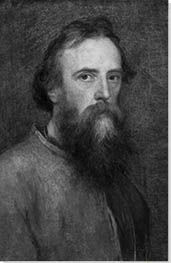 Although Watts was a contemporary of the Pre-Raphaelites - he was well acquainted with members of the brotherhood and shared many of the same ideas - he is in fact more typical of a British artist in that he remained relatively isolated and unaffiliated with a particular movement. Like the Pre-Raphaelites though, and his friend Julia Margaret Cameron, Watts was inspired by literary references and practiced a holistic form of art making whereby poetry, philosophy, music, and general suggestions on how to live as a good person were all combined. In many ways, Watts was a man before his time. It was a radical statement of the day to say, "I paint ideas, not things", for such is the premise of Modern Art and following that, Conceptual Art. His paintings look forward to the intricate canvases of the French Symbolist Odilon Redon, and similar to Redon, Watts' early explorations of the unconscious, dream, the irrational, and the imagination, led him to expose monsters. Both artists successfully uncover horror and darkness in man, as well as creativity and strength, and as such, their malevolent human hybrid creatures (in particular depictions of the Minotaur) recall those of William Blake, Francisco Goya, and Pablo Picasso. Following extended travels in Italy, Watts was heavily inspired by the art of early and high Renaissance. He was influenced, not only by the soft color palette (particularly the hazy blues and icy pinks), but also by his desire to present an audience with a whole and epic story. Inspired most significantly by Michelangelo's Sistine Chapel (1508-1512) and by Giotto's Scrovegni Chapel (1305) he consequently aspired to create his own 'House of Life' (a united series of many of his canvases dealing with specific emotions). Like the Old Masters, he considered his body of work to be at once a didactic narrative and a synthesis of spiritual ideas. A genuine and humble artist, Watts was also a political man. He bequeathed much of his art to the British nation in the belief that art should be accessible because it helped human development and was a tool for social reform (an idea shared by William Morris). He celebrated the heroic acts of ordinary men at Postman's Park, and built a community Ceramic Studio, and an Art Gallery within an Artists' Village in collaboration with his wife in the village of Compton in Surrey. Indeed, Watts' wife, Mary Seton Fraser-Tytler, was a suffragette, and Watts' sustained love and support for her, as well as his consistent return to the theme of the brutal mistreatment, limited choices, and unacceptable second-rate position of women in society, earn him the label as an early Feminist. George Frederic Watts was born in Middlesex, a historic county in the south east of England that has since been swallowed up by London. His father was a piano maker and because of his love for music, named his son after the composer, George Frederic Handel, who shared the same birthday. The young Watts was a sickly child and as such was unable to attend school regularly. He was instead home-schooled by his father, both in a conservative Christian fashion but also with the introduction of interesting literature including Homer's The Iliad. Watts loved and held dear the inspiration that such ancient Greek texts brought him throughout his career, but resented and rejected the strict sabbatarian and evangelical household in which these were presented. Watts was deeply affected by the severe routine that he experienced on Sundays, and general restriction had a negative impact on his overall view of organized religion. As such, he questioned traditional biblical teachings and his own reimagining notions of 'the creator' can be seen in works through to the end of his life. Interactive chart with George Frederic Watts's main influences, and the people and ideas that the artist influenced in turn. First published on 23 Nov 2018. Updated and modified regularly.